LOCKLINEA short documentary about Frenk, his love for music and the search for a home. During my first meeting with Frenk, after 2 minutes he said: "When I was three years old, I arrived from Brazil, during the coldest winter the Netherlands had known, in Leeuwarden. This place became my second birthtown, here I feel at home. " At that moment I knew he would become the subject of my film. Visit frenkdefilm to see more films! In the short film we meet Frenk, born in Brazil, on his third adopted and raised in Leeuwarden. From a young age he discovered a great passion for music and dreamed of returning to Brazil at the age of 40. After all, when you're young, 40 sounds pretty far away. Now, he is 35 years old and his dream is becoming more and more reality. 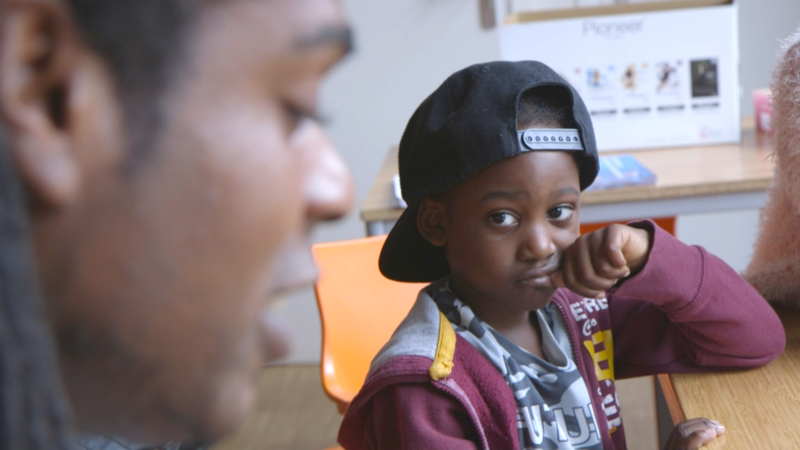 Through his passion for music, he started Sterrenfabriek, a place where he teaches children music lessons. His philosophy: music as a way to express emotions, to find comfort and joy. One day he hopes to help street children in Brazil with this concept. That far away country, which he barely remembers and where his biological father and mother have so far proved to be untraceable, is increasingly appealing to him. A Portuguese language course prepares him for his journey. 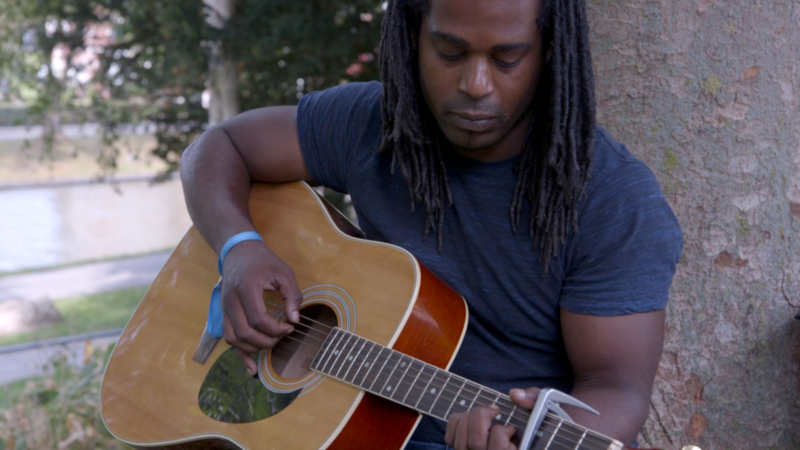 As he focuses on his dream, all kinds of questions arise: why can I really make music that well? Where do I come from? Who are my parents? Am I ever going to see them again? Am I actually Dutch or Brazilian? And where do I feel at home? With a film about Frenk, I hope to make a film about our search for identity and the way music can offer us comfort in life. It is that quest for identity in which Frenk and I recognize each other. I also asked myself in the personal films I made: where do I come from? Who are my parents? What does a home mean? And where do I belong? I try to investigate these questions by making films. Like Frenk, I find comfort and joy in the stories of people around me. People who tell me stories about where or with whom they experience that feeling of being "at home". Sometimes I find more questions than answers. But that always leads me to making new films. At the moment we are financing our film. Because we will make this film with a small crew, we already have half of our budget with the money from this cinecrowd campaign. With this money we can pay for our camera and sound equipment and finance the editing and sound processing. Frenk and I are currently making test images together, in which we are looking for scenes that evoke a tension between Leeuwarden here and Brazil there. 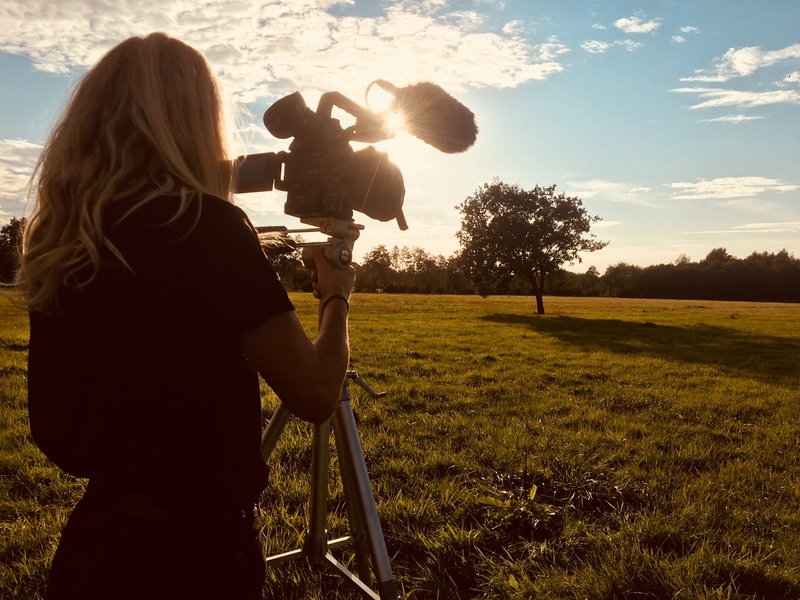 After finishing the Netherlands Film Academy two years ago, I am attracted to this more intuitive and spontaneous way of filmmaking as an experiment for myself as a filmmaker. The period of research and the period of shooting automatically merge. What we do know: the film will have its premiere during the Northern Film Festival from 5 untill 11 November 2018. And it will be broadcasted as a Fryslân DOK on NPO2 and Omrop Fryslân. We hope you will be curious about our search and support us in making this film. We make this film in collaboration with: New Noardic Wave & Omrop Fryslân. "Travel is nonsense," he announced. "The only thing you see is what's already inside you." HELDEN!! Super mooi project waar wij als Grutte Pier Brouwerij natuurlijk graag aan mee werken! Succes Froukje en Frenk! Zet 'm op Froukje! Wordt vast weer een mooie film! Heel veel succes Frenk en ik ben heel benieuwd naar de film! Veel succes Frenk. Die docu moet/ gaat er komen. Succes met dit prachtige project! We zijn jullie niet vergeten! Dankzij jullie steun is onze korte documentairefilm bijna af. De montage is op slot, er wordt as we speak gewerkt aan het geluidsontwerp en we hebben een nieuwe, sprankelende titel: VERGEET ME NIET. Ook kunnen we jullie hieronder alvast onze eigen filmposter presenteren. En last but zeker not least: we zijn genomineerd in de categorie Beste Korte Film op het Noordelijk Film Festival! Hou de avond van 7 november a.s. vast vrij in jullie agenda's want dan staat er een spetterende premiereavond te wachten op een speciale locatie in Leeuwarden. Kun je deze avond niet? 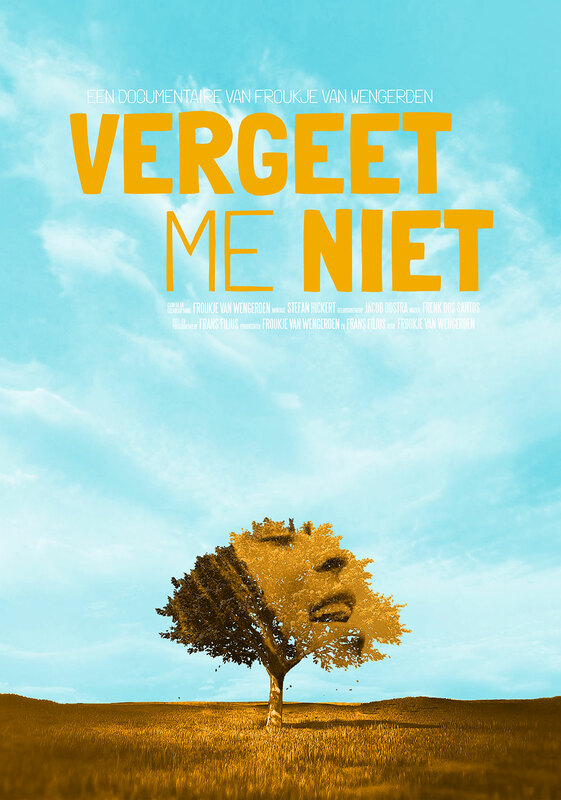 Niet getreurd want ook op donderdagavond 8 november kun je de film nog bekijken op het Noordelijk Film Festival. Hou onze mail in de gaten voor meer details over de premiere, het programma en tickets! Frenk & Froukje + het steeds groter wordende filmteam! 87% en €4.362 van de beoogde €5.000 behaald. Oftewel, een prachtig eindresultaat voor een maand crowdfunden en volgens CineCrowd zijn wij daarom geslaagd! Wij zijn hier ontzettend trots op. Met dit bedrag kunnen wij van MEU SONHO een geweldige eerste documentaire maken! Wij willen iedereen heel erg bedanken voor hun donatie en steun. We houden jullie graag op de hoogte met de verdere verwikkelingen van de film en de première tijdens het Noordelijk Film Festival in november. Omdat we net onder de beoogde doelstelling zijn uitgekomen (cinecrowd hanteert een minimum van 80%), zijn we verplicht even te melden dat je je donatie nog kan intrekken tot dinsdag. Uiteraard hopen we dat je ons blijft steunen want de film gaat er gewoon komen! Deadline: vanmiddag om 12 uur! Vandaag staan we in de Leeuwarder Courant, check it out! Tot vanmiddag 12 uur kun je ons nog steunen! Nog 43 uren te gaan! En we zijn een boom aan het filmen in Buitenpost! Waarom een boom? En waarom in Buitenpost? Deel, like, mail, schreeuw het op straat of stort gewoon geld en help a filmmaker out!!! Dank voor alle donaties tot dusver, dankzij jullie zitten wij nu op 55% van ons bedrag! Help ons verder door ons verhaal te delen met familie en vrienden, via de mail, via social media, mond op mond tijdens een verjaardag. Alle beetjes helpen! Dank voor al jullie gulle donaties. We zijn drie weken onderweg en bijna op de helft! Frenk en Froukje zijn begonnen met filmen. Zij hebben al een bezoekje gebracht aan de sportschool van Frenk, de Prinsentuin en het muziekfeest in de Vrijheidswijk! Kortom: Leeuwarden komt goed aan bod. Nog meer leuk nieuws: aankomende zondag nemen Frenk en zijn band de soundtrack van de film op in de studio, getiteld: Vergeet me niet! Kijk hier terug hoe zij repeteerden voor de opname. P.s. delen jullie ons project zodat we de eindstreep halen? Ondertussen hebben Frenk en Froukje al een aantal proefopname-dagen achter de rug. In deze opnamen kun je een kijkje nemen achter de schermen van Sterrenfabriek, waar Frenk muziekles geeft aan kinderen. En tot slot: we zijn er natuurlijk nog niet! Deel ons project met iedereen die ons wil steunen! Thank you! We will keep you updated because without your support we cannot make this film. Thank you for your kind support! We keep you updated and proudly mention your name on our credits. Thanks for supporting our dream! We keep you updated, we proudly mention your name on our credits and you will receive a link to the film as soon as it is finished. Yeah thanks! We keep you updated, we proudly mention your name on our credits, you will receive a link to the film as soon as it is finished and you will personally receive the original soundtrack of the film, written and performed by Frenk, from us. Nice man! As thanks for your support, we keep you updated, we proudly mention your name on our credits and you can see those credits roll yourself during the premiere at the Northern Film Festival in Leeuwarden in november. Wow! As thanks for your support, we keep you updated, we mention your name on the credits, you can see those credits roll yourself during the premiere at the Northern Film Festival in Leeuwarden and you will receive that day a special word of thanks with a unique film poster. Fantastic! As thanks for your support, we will keep you updated, we will mention your name on the credits, you can see those credits roll yourself during the premiere at the Northern Film Festival in Leeuwarden, you will receive that day a special word of thanks with a unique film poster and afterwards we treat you to a real Leeuwarder drink at a unique location. Unbelievable! As a thank you for your rock-solid trust in our project, we will keep you updated, we will mention your name on the credits, you can those credits roll yourself during the premiere at the Northern Film Festival in Leeuwarden, you will receive that day a special word of thanks with a unique filmposter, we drink a real Leeuwarder drink at a unique location afterwards and Frenk & Froukje will come to your livingroom with guitar and camera.